Some feel-good stories are true. William Kamkwamba‘s is one of them. Forced to drop out of school in Malawi because his parents couldn’t afford the tuition, he decided to educate himself. Unwittingly following the path of Andrew Carnegie and hundreds of the entrepreneurs of the nineteenth century, he used the most basic tool available for intellectual growth: a small local library. 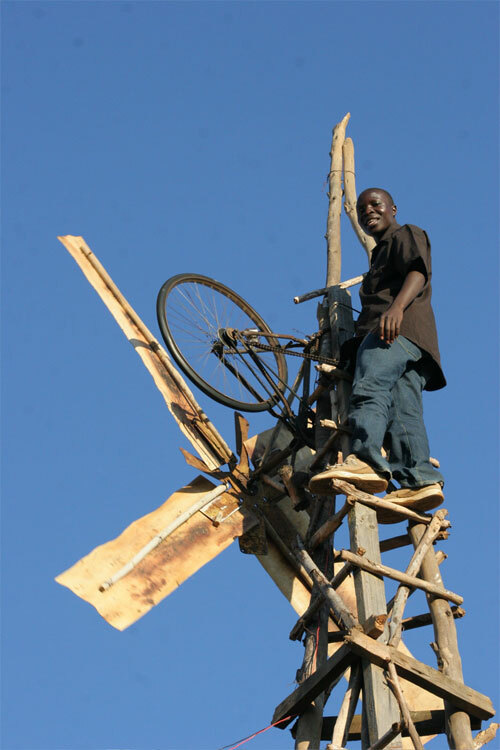 When the drought in Malawi grew severe in 2002, he remembered a picture and description of a windmill in a beat-up book. He was intrigued: perhaps a windmill could pump water for his father’s farm, or bring electrical power to his home. He decided to build one using parts scrounged from the local dump, and any information he could gain from the books in the library. He was ridiculed by the rest of the village – no one had ever seen a windmill. They thought he had gone crazy or was smoking drugs. He persisted. His first attempt, 15 feet tall with blades made from flattened pieces of plastic pipe, was enough to run a light bulb dimly. The next attempt, 40 feet high, generated more power. A year later, as he learned more about renewable energy, he brought solar power to the village. Last year, he built a windmill for pumping well water – fulfilling his dream. His success has been noticed. He was invited to the Technology Entertainment Design conference in Arusha, Tanzania. He was given a scholarship to the African Leadership Academy in Johannesburg. The original story points to the need to foster initiative in even the poorest African nations, and to the contributions each child makes to the survival of a family. All true. But they ignore the other hero in this story: the Library. The books were old and dilapidated, cast-offs from somewhere else. But they conveyed a basic knowledge of physics, electricity, and wind power. Those books provided the spark, the first idea, which William Kamkwamba was able to fan into a flame. Libraries are often overlooked as development projects. Other ideas are seen as directly practical, or more modern, or more useful. Books, though, are portable, easily shared, enduring, and reliable. While the article speaks of solar power and wind power, the original power in that village was library power.